I developed a simple graphic in R using GGJOY (an offshoot of GGPLOT2) that presents all the distributions of first dimension of House common space DW-NOMINATE scores. GGJOY seems to work quite well for time lapse presentation of distributions. Update 11/9/2016: Of course, no one can blame you for thinking that. This is a sketch of a few possible arguments for voting in presidential election, despite the often heard claim that voters in predetermined, non-battleground states are, in some sense, disenfranchised. It’s a grating argument, too clever by half. We customarily presume that a presidential election two distinct electorates: the minority of voters who live in swing states, and everyone else. As of August 1, three quarters of all Americans who live in a state where the leading party has an 80% or greater chance of winning. Voters in the swing-less states won’t directly influence the final outcome. You’ll hear that We sometimes like to think of these voters in these states as disenfranchised. To be certain, the individual experience of a presidential election is heightened in a contested swing state. Candidates spend more time and money, and the media focus is sharpened. Turnout is greater. Voters are less likely to stray from two major parties. But it doesn’t necessarily follow that a voter in a reliably red or blue state has no influence on a presidential election, or at least, has diminished influence because the state’s winner is known in advance. And living outside of a swing state does not give a voter an additional excuse to sit out an election. A vote for a Democrat in Idaho or a Republican in California has importance, and I want to sketch a few supporting points suitable for further development. Suppose we believe that Clinton’s victory over Trump becomes a foregone conclusion. We can safely argue that the reward of your vote is reduced, but is it reduced to zero. Something else has to be at stake. 1. The old argument about the miniscule marginal effect of your individual vote has just as much relevance in a swing state as it has anywhere else. An election in a swing state isn’t going to turn on your individual decision to vote. 2. The nationwide popular vote doesn’t determine the winner, but it has meaning. I’m willing to assert that the first Bush 43 amendment, despite its unapologetic public face, really would have preferred a popular vote plurality. The reasons have nothing to do with the strategic choices required in a presidential election. 3. Mandates aren’t the only reason to run up the score, or close the margin in an election that will be lost. The notion of a policy mandate is an idea that political science has discredited. Surprises in the margin of victory can affect strategy for upcoming elections, create a sense of vulnerability or security for the future. 4. Legitimacy of the outcome. The more decisive a victory becomes, the more difficult it becomes for the challenger or the media to wonder about its legitimacy. This year, a resounding defeat of Trump will mean more than a comfortable but lackluster victory. For now, this is a sketch for a larger argument that we have good reasons to vote when the outcome in a state is predetermined. This is particularly so when the overall outcome is in doubt, or if people are paying attention to the size of the victory. The demographics of U.S. legislative districts are easy to find, and they will always interest me. The most basic demographic data point is district headcount. Districts begin the decade with equal population, but population grows and shifts significantly in a short period of time. How much variation do we see? Quite a bit, and in recent years, growth skews strongly in the direction of districts represented by Republicans. The trend isn’t surprising, and it conforms to population growth trends that are more general (e.g., Texas is growing rapidly, the northeast isn’t growing very much, though more than you might suppose). Keep in mind that the population grew from 281 million to 308 in 2010, and 320 million at the start of 2015. For the 2000-2010 decade, this graph shows the distributions of population growth for Democratic and Republican state lower house legislative districts as of 2012, the last year that 2000’s redistricting cycle was in effect. In some posts to follow, I’ll offer some suggestions about the potential implications of this trend, and examine the pattern since the last redistricting cycle. Five states are not yet included in my dataset, but the overall average for GOP held districts is somewhere in the 13%-15% growth range, whereas Democrats are closer to 2%-4%. About 1/4 of districts lost population in this period, and 2/3 of these are Democratic. About 1/5 of districts grew by 20% or more, and 4/5 of these are Republican. Similar tendencies appear for the U.S. House. The trend follows from widely documented growth in red states and suburbs. The typical reaction says the trend, if it means anything, confers some kind of advantage to Republicans. Maybe that’s true, but it also suggests the possibility that Republican held districts are changing and their constituencies are less stable. What does the variation of district population growth tell us? The next several posts will examine some descriptive data and test a few possible outcomes. Population growth is a relatively easily obtained metric, and some of its lessons may be hiding in plain sight. I’m working on a paper about a phenomenon called intra-district divergence. It’s a simple idea, coined in a paper by McCarty Poole and Rosenthal (2009) and the idea has probably been given a dozen names at different times, but essentially refers to the difference between the representation of GOP and Democratic legislators for districts with similar partisan characteristics. I live in Oregon’s 3rd district, represented by Earl Blumenauer. If, say, Jamie Herrera Butler (R, WA-03) represented OR-03 instead, you can bet she would generate a different voting record and legislative history. The difference between Bluemenauer and hypothetical-Butler is the intra-district divergence, and there are some imperfect but usable ways we might try to measure it. Intra-district divergence isn’t necessarily a problem, but a casual observer could ask, “why should Blumenauer and Butler represent this district differently, but for undue partisan pressure?”. Presumably, they would both want to keep their jobs, and they would both need to account for the same hemp-fueled partisan profile in OR-03 to win an election. If you’re bothered by partisan polarization, you need to think about this kind of phenomenon, and try to explain its apparent increase. The analytical problem, of course, is that we can’t observe this divergence directly. We have to estimate the behavior of hypothetical Butler and compare that guess to the genuine record of Blumenauer. The reality is that OR-03 will not elect a Republican any time soon, so this projection about Butler requires a few awkward assumptions about district partisanship and legislator sensitivity to it. Washington state has 49 legislative districts and elects 98 state representatives. The vertical axis on this graph uses measure of legislator ideology called the NPAT score, and it’s based on the same technique known as DW-NOMINATE that you often see applied to Congress, using roll calls and adjusted for some survey data (see this updated dataset described by Shor and McCarty 2011). Points that appear higher on this plot (arbitrarily chosen) reflect a more conservative voting record, and unsurprisingly, Republicans in red appear on the top and Democrats in blue appear on the bottom. 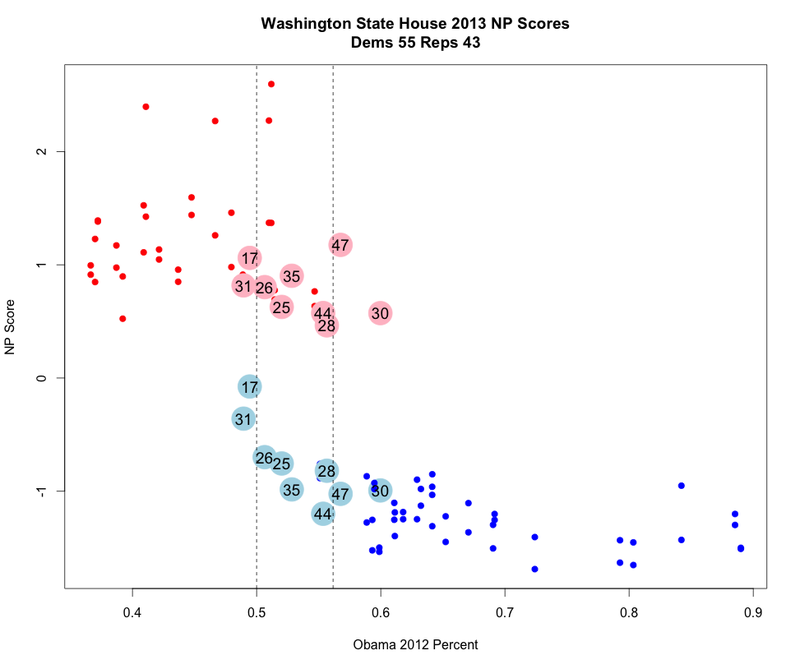 The left hashed vertical line represents 50% support for Obama in 2012; the right hash line represents the 56.2% that Obama won in Washington state. Notice that each point has a vertical twin with the same Obama 2012 Percent. Most districts elect two members from the same party, even though Washington has a top two primary system. But some districts elect from one each party, and I have enlarged and numbered those districts in the plot. Let’s call these “blended districts”. With a couple of exceptions, you can see that the divergence (the gap between the Republican and the Democrat) is essentially the same for the blended districts. Elect a Democrat, you get a liberal, and elect a Republican, you get a conservative, and the other distinctions pale. Two exceptions are worth noting. You see more conservative-than-usual points for the Democrats elected in Districts 17 and 31. These districts elected one Democrat, even though most voters chose Romney over Obama. Look here for all the 2014 results. The District 17 Democratic represenative was Monica Stonier. For her trouble, as she tried to contort adapt her voting record to the conservative bent of her Vancouver, Washington district, while undoubtedly angering her Democratic caucus, she was defeated in 2014 by a Republican (51.6% to 48.4%). The District 31 Democratic representative is Christopher Hurst, whose record was even more conservative than Stonier’s. Hurst barely won reelection by the percentages of (I kid you not): 51.6% to 48.4%. The bottom line: look to the “D” or the “R” for the most important information about the way your representative is going to perform. Resist claims to the contrary, implied or otherwise. (see PPS below). * South Dakota splits one of its districts into two subdistricts. PS: You might say, “if we think of states in the U.S. Senate as districts, they they, too, are multimember”. The problem with analyzing the Senate this way is a) they don’t elect their two members in the same year and b) it’s the U.S. Senate, which for a variety of reasons, is an idiosyncratic, single point of comparison. PPS: Monica Wehby was the Koch-fueled Republican challenger to Oregon’s U.S. Democratic Senator Jeff Merkeley in 2014. Since she’s a doctor, she was clearly the best choice for bi-partisanship, just like Dr. Paul Broun (GA-10). We know that turnout is one of the featured discussion points of the 2014 election. I am working on a research project using every single individual voter record from Washington state. These records give you names, addresses, birthdates, registration dates, and more. Jeff Bezos’s voting history in Washington became a public point of discussion around the time of his purchase of the Washington Post. 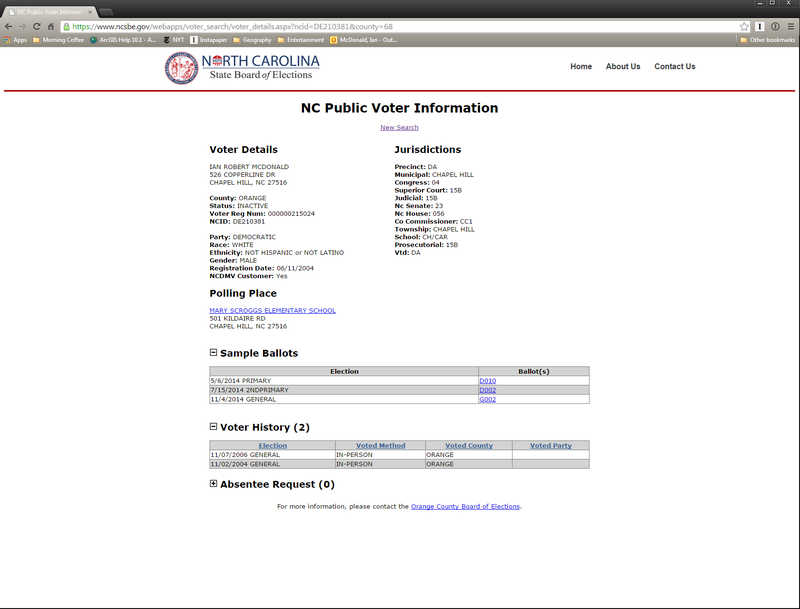 Do most people understand that their individual voting history is public and, in most cases, easily obtainable? You could shame or reward anyone with this information, immediately, if the recipient actually wanted to know. If a prospective employer cares about a person’s publicly available credit history, why not consider a person’s turnout history? There is an enormous literature on the relationship between social pressure and voter turnout, and we have strong experiment-based evidence that social pressure can build an incentive to vote (see, for starters, Gerber Green Larimer 2008). Voting is a time honored free ridership problem, and if you believe the best solution to free ridership is a selective cost or benefit (or even the small prospect of a selective cost), wouldn’t awareness about the easy availability, and the persistence, of the information change the decision for many people? Suppose you worry about your personal Uber customer rating, either because you think its availability is invasive or its a helpful way to reveal your good behavior. Why wouldn’t you worry about your turnout history? Yakima Daily Herald’s background piece on WA-04. Here’s an excellent backgrounder from Mike Faulk at the Yakima Daily Herald. Are the differences between Didier and Newhouse substantive or symbolic? A bit of both…in my reading, more of the latter. If it passes, they will disappear in general elections, and for all practical purposes. The Libertarians, the Pacific Greens, the Constitutionalists, and so on, will vanish, along with pieces like this one from OPB. Supporters might understand this, and figure it’s a price worth paying. That’s ok; you can plausibly argue that they don’t matter if they aren’t going to win. I bet a lot of “yes” voters are going to be surprised.